More than 40 passengers were safely evacuated from a southbound Red Line train that became stranded for more than two hours between stations in Quincy due to a power failure, MBTA officials said. Spokesman Joe Pesaturo said the train lost power around 7 a.m. Monday, and the final passengers were escorted out of the cars around 9 a.m.
Quincy police said the train was stuck near the Water Street Bridge and the Bergen Parkway. Police spokesman Captain John Dougan said Quincy fire and the MBTA cleared a path through the snow near Federal Avenue so passengers could be evacuated. More than 40 passengers were safely evacuated from a southbound Red Line train that lost power. Pesaturo said the 48 passengers were safely taken off the train and transferred to a bus. At Quincy Adams station, dozens of people climbed aboard shuttle buses for transport to the Braintree station. Shuttle buses were also taking passengers from the Quincy Adams station north to Quincy Center. 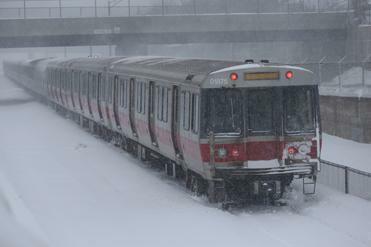 The train was stranded on the Red Line’s Braintree portion and the T had earlier halted all service on the line because of the steadily increasing snow. Kristen Schultz, 26, a Massachusetts General Hospital emergency room nurse, waited Monday morning at the Quincy Adams station to be bused to the JFK station and then on a train to Boston. She had already been traveling two hours from her home in Mansfield. “It’s certainly inconvenient but I’ll get there eventually,” she said. Later Monday, she said, she will have to figure out a way to get home when her shift ends at midnight. Sean P. Murphy can be reached at smurphy@globe.com. Follow him on Twitter @spmurphyboston.John R. Ellement can be reached at ellement@globe.com. Follow him on Twitter @JREbosglobe.